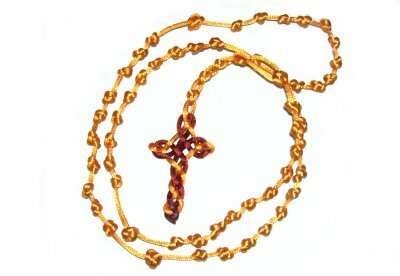 Description: The Satin Rosary features decorative knots that represent the beads in a standard Rosary. 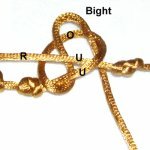 This Micro-Macrame pattern may be challenging for beginners, unless you have prior experience with all the knots used. This custom Macrame Rosary features a Celtic Cross. Be sure to use that page along with this one, since you need to make the cross first. Satin cord is by far the best, but any material will be suitable. Just make sure the material doesn't stretch too much. Yarn will not work for this project. Important: Satin cord is very fragile. 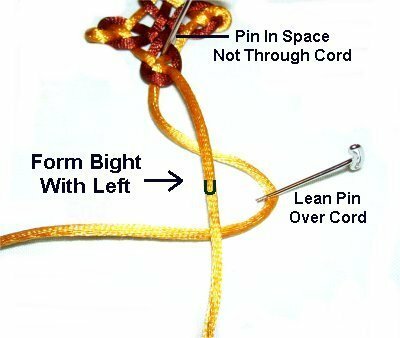 Use the Cross-Pin Technique or LEAN the pins over the cord, rather than putting them through the material. Cut one cord at least 36 inches in length. 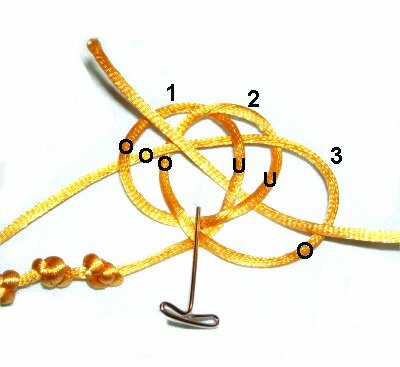 In the example, the rust cord is the short one. Cut a second cord at least 5 yards long. 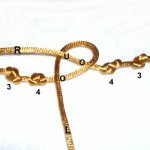 This is the gold cord in the example shown. It's used to create part of the cross and then the Satin Rosary. Click on this link to go to the Celtic Cross. It should be in a new window, so you can move back and forth between the two pages. Start with the short cord, so the ends are at the bottom. The long cord is used to make the second portion, so the ends exit the cross at the top. The cross should be around 2 inches in length when you are finished tightening it. Trim the ends at the bottom to 1-inch and glue them to the back of the cross. Wait until the glue is dry before moving on. 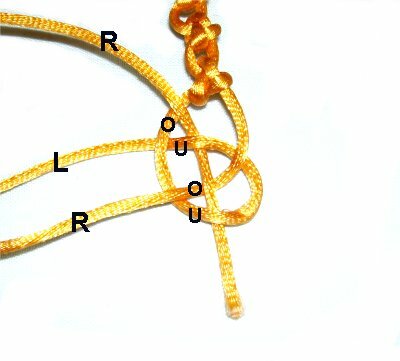 Here is a diagram of a Rosary, showing the different steps where the knots are placed. The numbers on the inside of the circle refer to the number of knots that are tied. 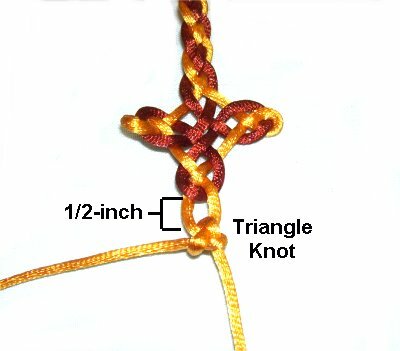 You will be making 4 Triangle Knots for the first part of the Satin Rosary. 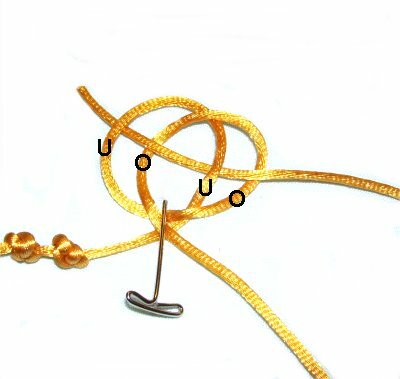 Other knots can be used, but choose those that are tied with two cords. Step 1: Secure the cross so the two cords are vertical. Form a bight with the left cord, pushing it to the right, passing under the right cord. Bring the right end under the left. Pass it through the space between the cords, in the area above the bight (just below the cross). It should go through under - over (from below). Bring the right end down, and pass it through the bight over - under. There should be a 1/2-inch space between the cross and this first knot. 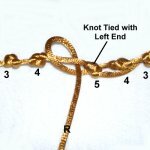 Move down 3/4-inch, and then tie 3 more Triangle knots. 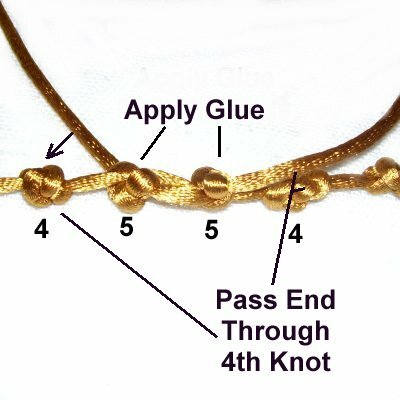 Step 2: Now you will make 1 Josephine knot for the Satin Rosary. 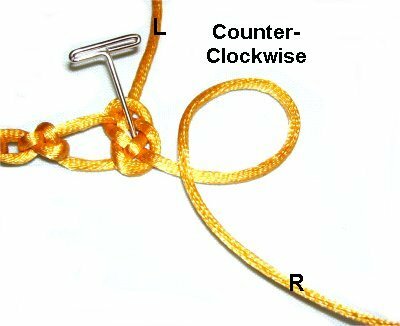 Make a counter-clockwise loop with the left cord. The end should pass under to make the crossing point. Bring the right cord over the loop, and then under the left end, moving clockwise. Weave the right end over - under - over - under the four segments as shown. 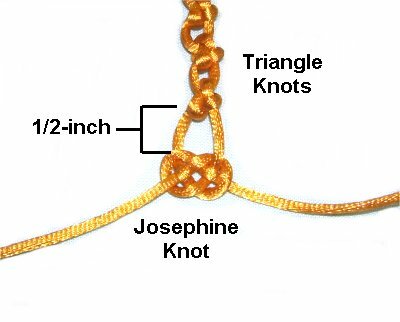 Position the Josephine knot so it rests 1/2-inch below the 4th Triangle knot. Tighten it so it's as small as possible. 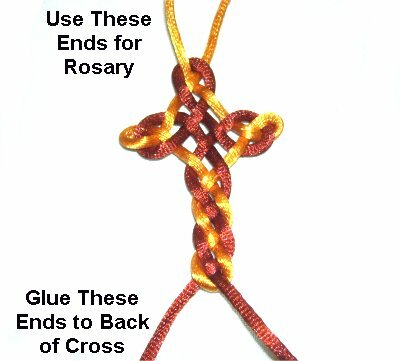 Now you will make the circle of knots for the Satin Rosary. The Oysterman knot was chosen because it is easy to tie. You can use another type of knot, but make sure it can be tied with one cord, such as the Celtic Button Knot. Step 3: Turn the first part of the Satin Rosary so it's on your left, and secure it. Make a counter-clockwise loop with the right half of the cord. Push it through the loop under - over (from below). This part of the knot determines the final position. 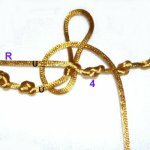 Make sure there is a 1/2-inch space between it and the Josephine knot. Pass the end under the 1/2-inch space you left, next to the tightened portion. Move it through the bight over - under (from the top). Pull on the cord close to the tightened portion. This will tighten the bight. Pull on the end to tighten the remainder of the knot. Important: Since the cord is very long, you can bundle it up by wrapping it around your hand. Wrap the end around the bundle a few times, and tuck the end under one of the coils. 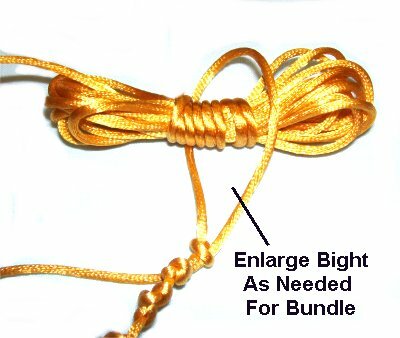 You can enlarge the bight before passing the bundle through, and then tighten the knot. Step 4: Repeat step 3, tying a total of ten (10) Oysterman knots for the Satin Rosary. Position them close together, so there is about 1/4-inch of space between each one. 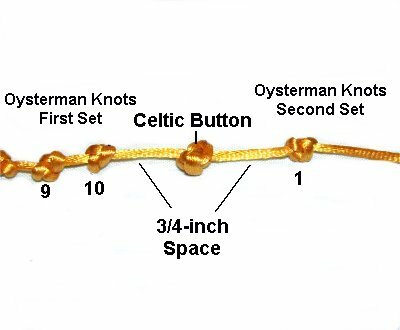 Step 5: You will now tie one Celtic Button knot between the sets of Oysterman knots. 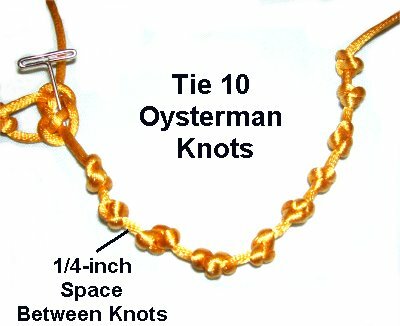 Make a counter-clockwise loop, so it rests about 3/4 inch away from the 10th Oysterman knot. Make a second counter-clockwise loop. Place it on top of, and slightly to the right of the first. There should be three obvious spaces. 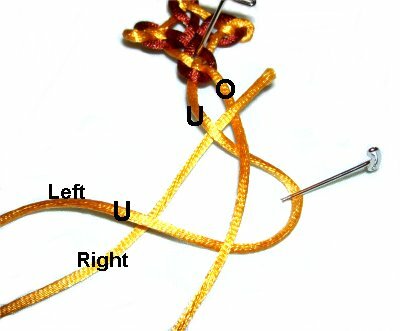 To make the third loop, pass the end through the first two loops heading right to left. It should weave over - under - over - under the four segments. Bring the end around again, moving right to left. Pass it over the right area of loop 3, and under the next two segments. Tighten the Celtic Button knot carefully, removing the slack in the order the loops were made. Design Tip: Tightening Celtic Buttons is challenging. 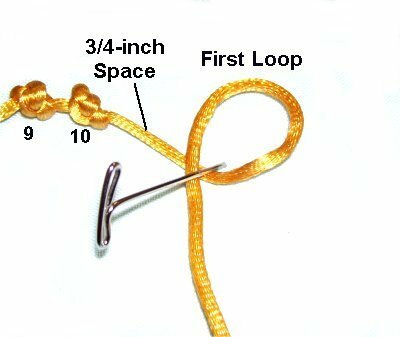 To arrange the loops at the right place, adjust the placement as you tighten the first two loops. Once the knot is where you want it, tighten the 3rd and 4th loops. 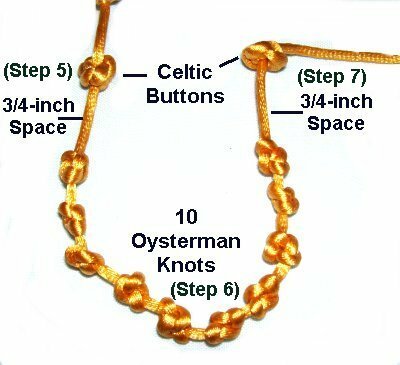 Try to position the Celtic Button so it remains 3/4-inches away from the 10th Oysterman knot tied in Step 4. Leave a 3/4-inch space on the other side, before moving on to the next step. Step 6: Repeat steps 3 and 4, tying ten (10) more Oysterman knots. They should be 1/4 inches apart. Step 7: Repeat step 5. Start with a 3/4 inch space, tie the Celtic Button, and leave another 3/4-inch space. 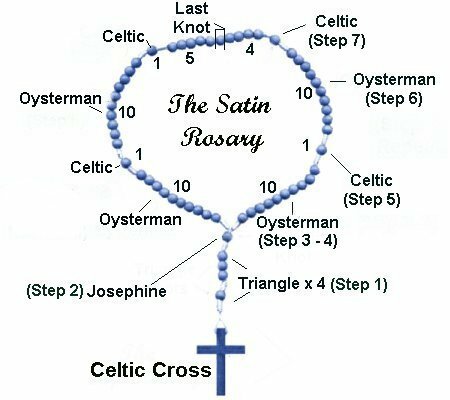 To make the last section on this half of the Satin Rosary, tie only four (4) Oysterman knots, as in step 3. Step 8: Repeat steps 3 - 7 using the left half of the cord. 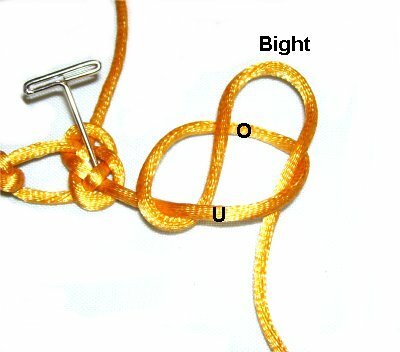 Place both halves side by side to make sure the knots have the same spacing. 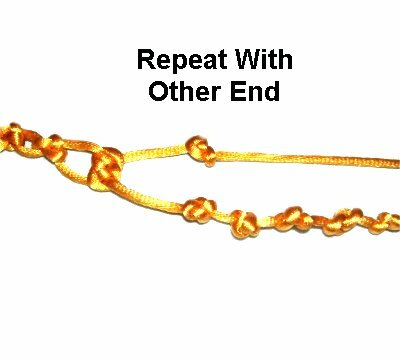 Step 9: Position the Satin Rosary so the two ends are close together, one above the other, heading opposite directions as shown below. 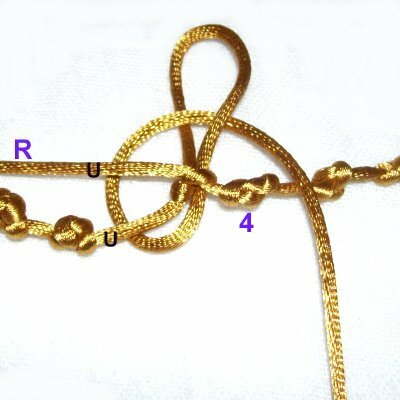 The last section has 4 knots, so mentally number them. Move the cords until there is 1 inch of space between the 4th knots of both halves. 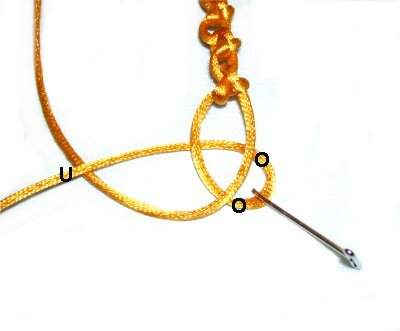 Use the left end to make the first loop of an Oysterman knot, passing over - under the right end. 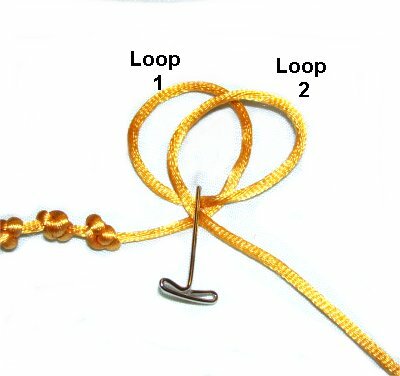 When you make the bight, pass it under the right end as you bring it into the loop from below. Apply a small amount of fabric glue. Pull the bight to tighten the loop. 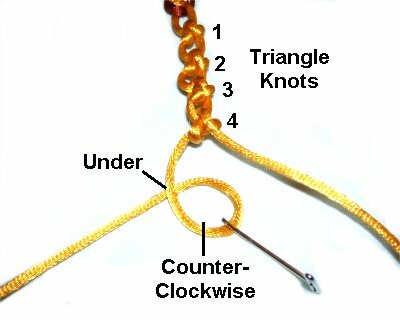 Tie the rest of the Oysterman knot, passing the end under the portion coming from the left, as well as the right end. 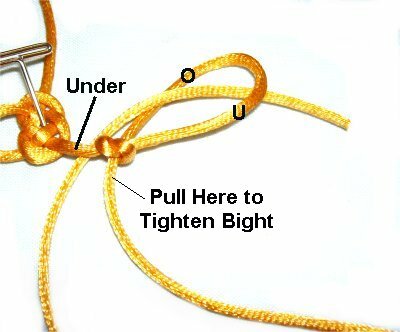 When you tighten, make sure this knot (#5) rests 1/4-inch from the 4th knot on the right. Step 10: Move the right end down so it rests below the portion coming from the left. Repeat step 9. You may need to change the direction you tie the knot. 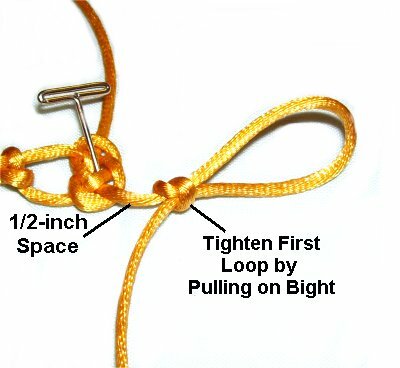 Tighten it between the 4th knot on the left and the 5th one you just tied on the right. 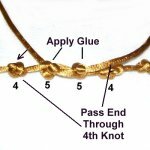 Apply glue to the two knots just tied. Pass the ends through the 4th knots on each side, using tweezers. You can loosen the knots slightly if needed, then re-tighten. Apply more glue. 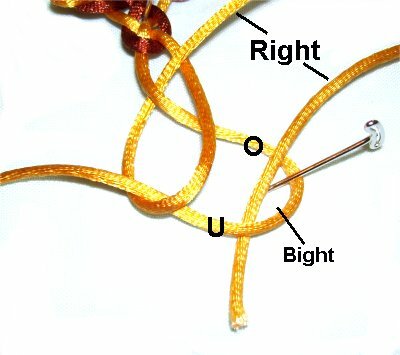 When the glue is dry, cut the cords close to the knots and melt the tips with a flame (if using Satin). Click on this image to see a larger view of the completed Satin Rosary. 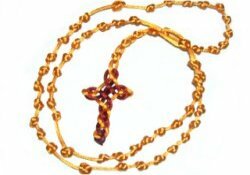 Have any comments about the Satin Rosary? Contact Me.